1) Combine the 12 tbsp butter with the 1/3 cup light brown sugar until well blended. Spoon it into muffin tins (12 cup), it’s approx one rounded tablespoon in each one. 2) Lightly flour work surface and open out one sheet of the pastry. 3) Melt the 3 tablespoons of butter, stir the cinnamon into it and brush half of it all over the pastry sheet. 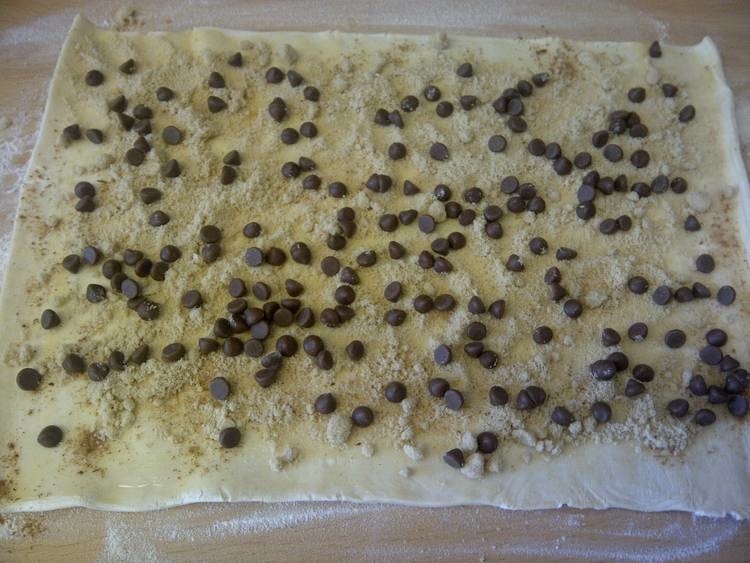 4) Sprinkle 1/3 cup brown sugar and 1/2 cup chocolate chips or raisins over the pastry, leaving a 1 inch border. 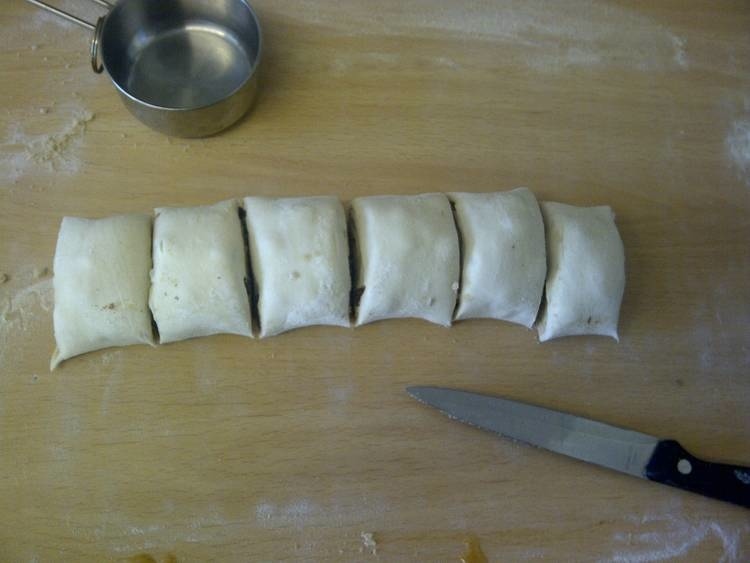 5) Starting from one of the short ends, roll the pastry up. Cut a small amount from each end of the roll to straighten up, then cut the roll into six pieces. 6) Place each one, swirl side upwards, on top of the butter/sugar mixture in the muffin tins. 7) Repeat with the second pastry sheet. 8) Bake in a pre-heated oven 400F/200C for half an hour. 9) Allow to cool in the pans for just a couple of minutes until the toffee has stopped bubbling. Then remove them carefully with a large spoon and turn them upside down onto a sheet of parchment paper, spooning any extra toffee left in the bottom of the pans over the top. Take care not to leave them too long in the pans or the toffee will weld them in there! Allow them to cool completely on the parchment paper, then store them in an airtight container. I know what you mean, those frozen puff pastry sheets are a great time-saver! Reblogged this on Bold & Beautiful. Yes, actually the original recipe that I adapted these from had pecan pieces placed in the bottom of the muffin cups with the butter and sugar so that they ended up stuck on the top at the end. I’m sure that would be really good, I was just doing a simplified version here! What I do like about this recipe is that you can control (at least a bit) how much chocolate, sugar, and butter you put in/on it. 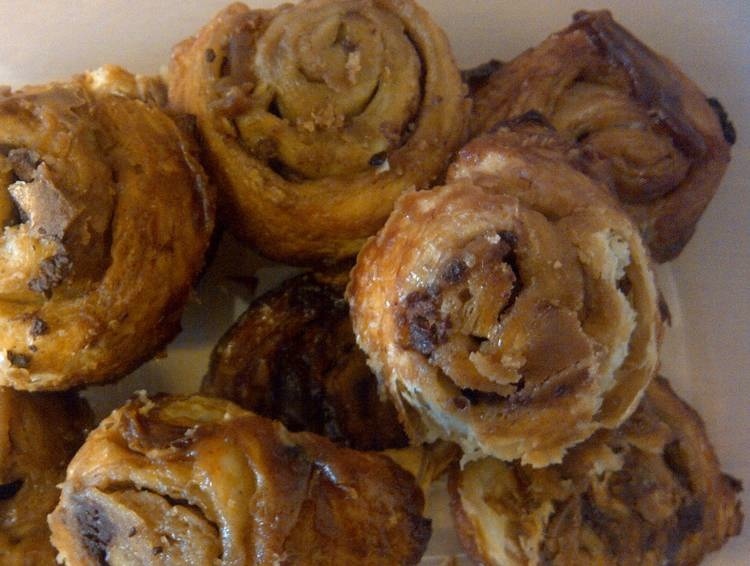 I’ve had some cinnamon buns in the past, but they are often too sweet when picked up from a store. This one could work out well. 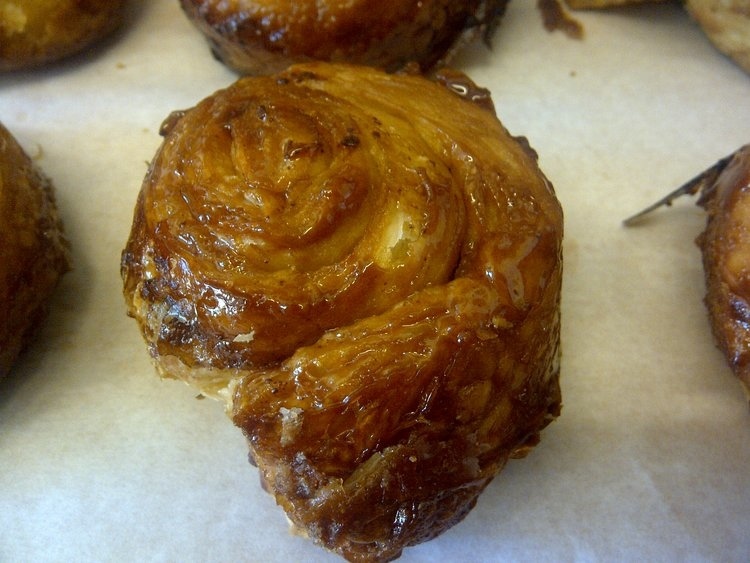 Yes, the pastry isn’t sweet so you can definitely reduce the overall sweetness by putting less sugar on before rolling. Even the amount in this recipe which seems a lot when you put it on, tastes less sweet that store bought ones, so goodness knows how much sugar they use! I probably wouldn’t reduce the butter myself because they may end up a bit dry, although if you used raisins rather than the chocolate chips that I used, that may help counteract that. I’m not a pastry fan, but I shall keep your recipe to hand as I reckon my mum and my man would love these! Well, they’re very easy, so you could make these for them and score yourself some brownie points!